Former Hawaii Gov. 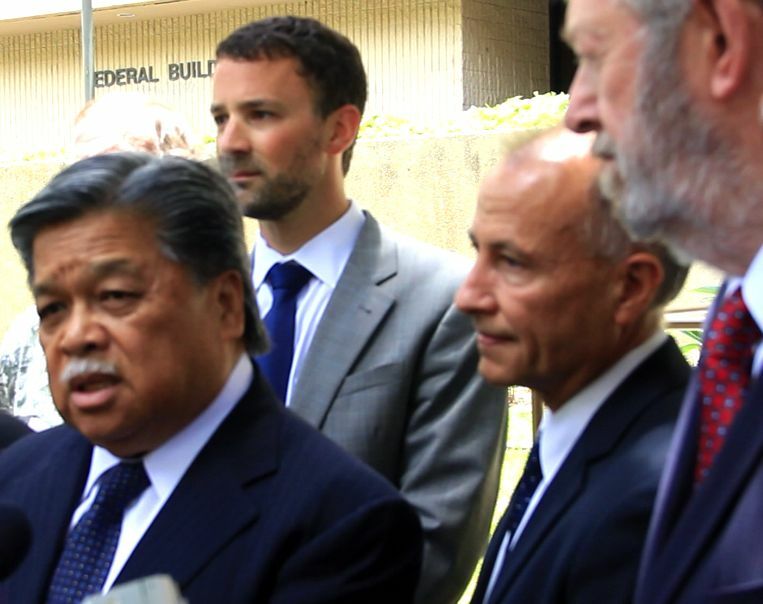 Ben Cayetano, UH Law Professor Randall Roth and Retired Businessman Cliff Slater with their attorney outside federal court. Honolulu’s controversial rail project has been derailed in federal court. This after Ninth Circuit Court Judge Wallace Tashima ruled today in HonoluluTraffic.com v. Federal Transit Administration et al that the city violated federal law on major three counts. On December 12, the plaintiffs will return to court to ask the judge to grant a permanent injunction against the city, which could halt the rail project for good. The eight plaintiffs who brought the challenge against the city and FTA last Spring include former Gov. Benjamin Cayetano, University of Hawaii Law professor Randall Roth, Retired Judge Walter Heen, retired businessman and transportation expert Cliff Slater, Dr. Michael Uechi, Hawaii’s Thousand Friends, Outdoor Circle and Sen. Sam Slom’s Small Business Hawaii Entrepreneurial Education Foundation. They oppose the city’s $5.2 billion elevated steel on steel rail project, because they believe the project will bankrupt the city and destroy important cultural sites and the environment. Tashima, who is overseeing the case after all 7 of Hawaii’s U.S. District judges were recused, agreed the city failed to consider the traditional cultural properties, the impact of the rail on Mother Waldron Park and whether the Beretania Tunnel is an option to alleviate traffic. 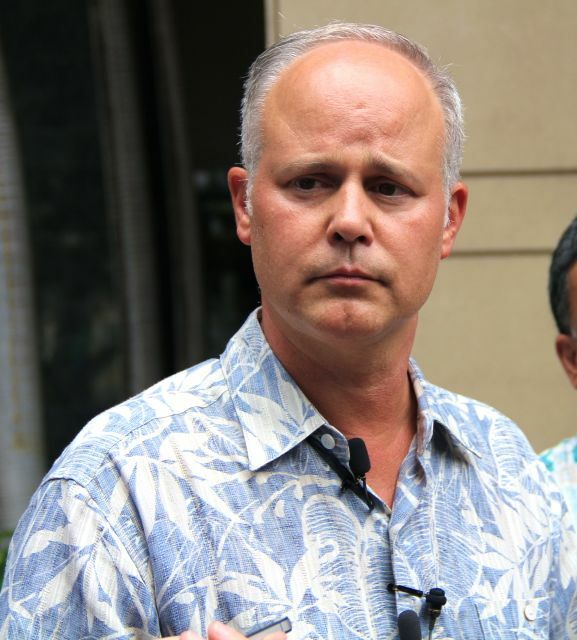 Cayetano, who in addition to being a plaintiff in the federal lawsuit is a candidate for Honolulu mayor, said the city will have to redo its Final Environmental Impact Statement and issue another Record of Decision. That could delay the project at least one to two years. “In December, we will find out if this is great enough to stop project permanently,” Roth said. But the city administration is declaring a victory. Honolulu Authority for Rapid Transportation CEO Dan Grabauskas said the city is pleased with the ruling because the city and FTA won on 20 of 23 counts. “On all the major issues, we have successfully shown that the project properly conducted the required analyses and environmental studies. The ruling underscores the fact that the majority of alternatives were given proper consideration, including bus rapid transit (BRT), at-grade light rail and managed lanes. We will be carefully examining the ruling to determine what further course of action is needed,” he said. Prevedouros, one of the state’s leading transportation experts and well known critic of the rail project, said redoing the paperwork will cost taxpayers at least $10 million and could take up to 2 years. Construction on the rail project is already on hold for as much as a year after the city lost another lawsuit, this one in state court. The Hawaii Supreme Court ruled in a unanimous 82-page opinion in Kaleikini v. Yoshioka, that the City did not comply with the State’s historic preservation and burial protection laws when it failed to complete an archeological inventory survey for the 20-mile route before starting construction. The lawsuit was brought by Paulette Kalekini, a native Hawaiian whose ancestors’ iwi or bones may be displaced by the rail. Her case, which was argued by the Native Hawaiian Legal Corporation on her behalf, brought the rail project to a halt on August 27. The delays are costing the city $7.1 million a month. The November 6 election could be strike three for the pricey rail project, which was narrowly approved by the voters in 2008, but has since lost popularity. Cayetano, who has promised to kill the project if he is elected mayor, has a slight edge in the polls over his pro-rail opponent Kirk Caldwell. Proponents of the rail project have spent nearly $3 million in negative ads and push polls attacking Cayetano leading up to the Primary and General elections, in hopes of stopping him from becoming mayor. Mayor Peter Carlisle said on April 23, the day the city started construction: "People can jump and scream and swear they're going to stop it, and they're going to have a real hard time doing it … It's idiot mayor proof because of the HART board, it's their decision, it is not the mayor's decision." HART CEO Dan Graubauskas said that day: "The column you see beginning construction today will be standing there 100 years from now." But Walter Heen, a plaintiff in the federal lawsuit, said when Paulette Kalekini won the state lawsuit that he thought the project was done for good. The project is managed by a consulting firm who developed the environmental documents and had a vested interest in the build alternative so that the consultant could continue to earn fees. This is a conflict of interest according to the environmental regulations 40 CFR Section 1506.5. 2. The cost of these additional "delays are costing the city $7.1 million a month" in a state economy where taxes are going to be increased to "pacify" these mainland company services – That Are Not Servicing Hawaii Rail!! 3. How much HART is earning during this "delay" that is going to cost the taxpayers!!! I wonder if there is a way for the people of Hawaii to create a petition to submit to the supreme court justices to completely shut these bragging idiots up about a Disneyland rail system in Hawaii that is going to sell Hawaii to another country "for the highest bidder." With such local stupidity, what other country would want Hawaii? Anyone who believes the rail project has been 'derailed' by the federal court decision obviously hasn't read the decision.